I have a soft spot for L’Aroma Cafe, as it’s one of the few cafes in which I’ve been able to actually sit down and write. 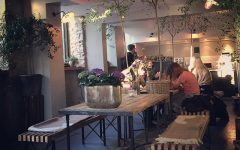 Now, I know tons of people who practically live in cafes — that’s where they get all of their work done and they thrive on the buzz and chatter around them. Me, not so much. I’m usually at home, brewing a Bialetti pot of coffee on the stovetop while working in the quiet. Super glamorous and exciting, no? L’Aroma Cafe changed that for me, though. The space is something of a rabbit hole. You step down off of the street into this wonderfully charming room that has the feeling of an Art Nouveau den, even though it’s lacking all of that fancy ornamentation. But that’s the feeling I get, so just go with it. 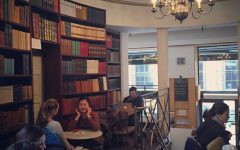 There are small, round tables spaced throughout the entire area, and it almost has a Parisian vibe — you’ll see people having lunch, just reading a newspaper, or even doing line-by-line edits of manuscripts. There’s really a bit of everything going on here. The coffee is great (big, frothy cappuccinos, please! ), but my favorite is during the summer months — they have this grapefruit spritz that for whatever reason I’m addicted to. (It’s possibly the sugar content, but let’s not go there). But back to my main point about being able to actually get work done here. It’s true. While there is some movement to the space, there isn’t the frenetic, endless in-and-out rush that a place like Starbucks usually has. It’s quieter and calmer. The people are also infinitely more interesting, and there’s always a melange of languages being spoken, which I love. One time I was working on a few short stories and a woman was talking about getting movie rights and clearances for a film release before Cannes film festival. Sublime eavesdropping if ever there was.